7g of L-Leucine to ignite protein synthesis and 3.0g Beta-alanine per serving to buffer lactic acid and improve muscle-pH. Does not contain the Gluconeogenic BCAAs: Iso-Leucine and Valine. Sweetened with Stevia. Clean-source, Vegan & Fermented Amino Acids. Guaranteed heavy-metal free through 3rd party testing. No artificial Colors or Flavors. Zero namesake ingredients such as Glutamine and Citrulline in insignificant quantities. Only fully dosed efficacious ingredients in line with the PROCEL brand philosophy. PROCEL BETA-LEUCINE is an advanced recovery fuel custom-designed for Ketogenic Athletes and Elite Athletes. Many of the free form amino acids we consume are gluconeogenic, i.e. they convert to glucose in the body. Two such amino acids happen to be the BCAAs- Iso-Leucine and Valine. This is something, which ketogenic dieters want to avoid. 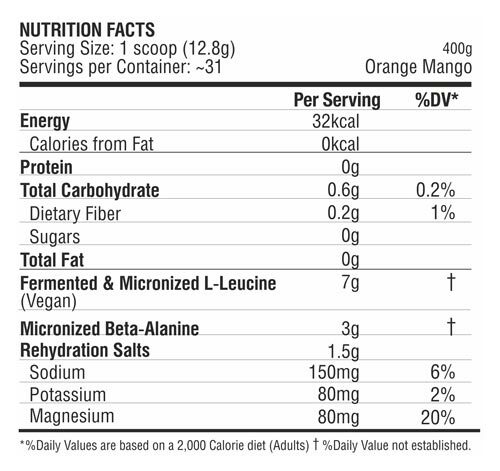 Each serving of PROCEL BETA-LEUCINE gives you over 7g of L-Leucine in a first-of-its-kind NON-GLUCONEOGENIC formula. Leaves out the Gluconeogenic BCAAs: Iso-Leucine and Valine. Also includes 3.0g of Beta-alanine in each serving to give you the lactic acid buffering edge + vital electrolytes and hydration compounds for a complete intra-training solution. Our All-Vegan Amino-acid line is manufactured using a unique fermentation process, which produces a cleaner, clearer molecule as opposed to most products on the market. As always, all PROCEL amino acids are micronized and instantized for superior absorption. Branch Chain Amino Acids (BCAAs) are essential nutrients that the body cannot make on its own, and are heavily depleted during periods of exercise and sport. One of the BCAAs- L-Leucine, plays a key role in muscle protein synthesis, the anabolic trigger which helps form new muscle tissue. Another key ingredient in ULTRA-BCAA is Beta-Alanine, which helps maintain the pH in muscle as well as increases its lactic acid threshold, thereby priming the intra-muscular environment for better performance through the delayed onset of fatigue. Q.2 Is BETA-LEUCINE a BCAA product? Q.3 Why are all the BCAA products presently available unsuitable for Ketogenic Athletes? Q.4 What is Gluconeogenesis? What are Glucogenic amino acids? Q.5 What kind of athletes can use BETA-LEUCINE? Q.6 What’s the difference between PROCEL UltraBCAA and PROCEL BETA-LEUCINE? Q.7 What is the role of Leucine in BETA-LEUCINE? Q.8 What is the role of Beta-alanine in BETA-LEUCINE? Q.9 What is the tingling sensation I feel when I consume BETA-LEUCINE? Q.10 Can I take BETA-LEUCINE year round?